So, my husband and I went to LA last weekend. 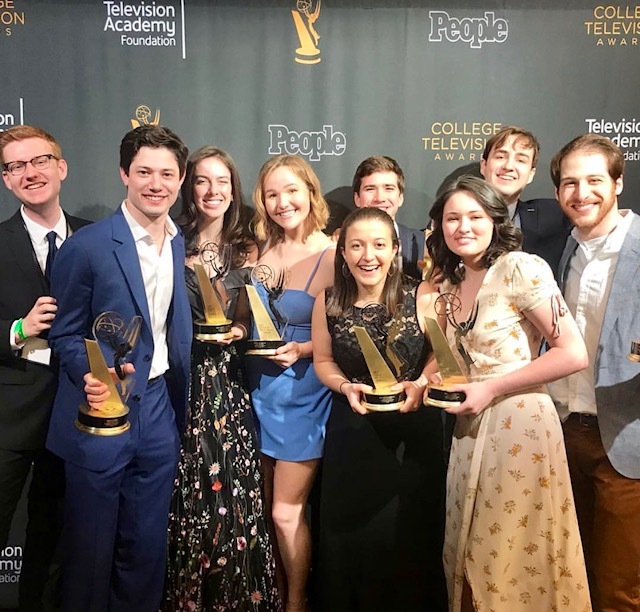 Our daughter was nominated for a College Television Emmy award with eight other college friends (shown above). Spoiler alert – they won! We love to go to LA. We lived there newly married and don’t need an excuse to head west. The reason we went this time is not something we anticipated though! Grace and her group were nominated in January, so we booked our flights right away and set up plans to see old friends and stay at a fab hotel in West Hollywood. The shot above is all of the nominees before the ceremony. Grace was booked solid for three days with Television Academy events, so we were on our own to shop, eat and wander around the west side. Our hotel was in a GREAT neighborhood, so we started there. Melrose Place has elegant stores and the first bricks and mortar Glossier I have seen – I know there is one in New York too. There was a line to get in AND two pink clad “guards” at the door letting people in. Or not. Nope -not waiting, too many other great place to go. Inside the actual store, it is crazy cutting edge. Again, was only able to get this quick pic of a Louis Vuitton Coachella painted bag before the guard ran after me to delete it. GUARDS EVERYWHERE!!!!!! There are vintage Hermes Birkin bags, designers I have never heard of and lots of cool things to see here. Next stop was The Great to see the vintage-inspired jeans by Current & Elliott. This is a really fun store AND they have the collection of Coqui Coqui fragrances that I love – inspired by Tulum and the Yucatan Peninsula. I had to see Selects Apothecary because of the amazing edited collection of skin and hair products. I could have stayed here for much longer, but Tim got fussy. Such a pretty entrance to the store. Bonus in the back is cool-girl Benjamin Hair Salon. The West Hollywood Farmers Market is amazing. Gorgeous fruit, flowers, freshly baked breads and pastries, organic coffee. Heaven. But the real reason we were in LA was to attend the College Emmy ceremony with Grace on Saturday night! We met her at the Television Academy in North Hollywood. She walked the carpet with all of the nominees and then networked while the parents had a cocktail party to meet everyone else. Her team was nominated for a filmed sketch they did at school and submitted to the Academy in the “Variety” category. Grace with all the other winners – it was a very exciting night! We are so proud of Grace and her team for this amazing accomplishment. All of the kids went to a big party after the ceremony, so we headed back to West Hollywood and had a late dinner at Petite Taqueria around the corner from our hotel. We were seated to the left of comedian Billy Eichner, with Christian Siriano from “Project Runway” on our other side. Almost too much to handle in one night. It was a fabulous weekend for Grace and for us. Fabulous news and great info all around!